“A significant objective of international development has focused on maternal mortality reduction in keeping with Sustainable Development Goal 3 aimed at reducing the maternal mortality ratio across the world to less than 70 per 100,000 live births by 2030. Whilst this is imperative, since women constitute half of the population and ensuring their survival implies recognising the potential they might play in the development of the country, much less has been done in terms of ensuring women’s overall health. In this regard, a healthy woman means a healthy family since her caregiving role in the family extends to maintaining the health status of family members. 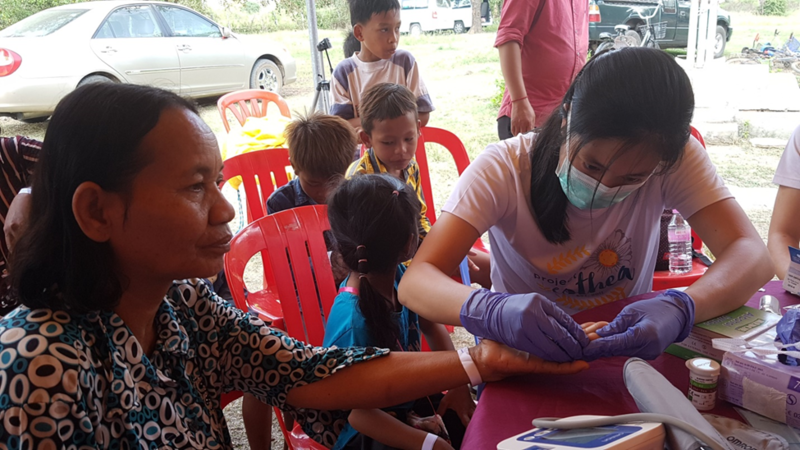 In November 2017, Soroptimist International of Singapore (SIS) supported a team of medical students from the National University of Singapore and 12 practising Singaporean doctors, whose mission it was to provide basic health screening and health literacy to villagers residing in the villages of Dangkut Thnong and Anlong Svay, in the Banan district of Battambang, the second poorest province in Cambodia. US $3000 was raised to cover drugs and medical supplies for Project Sothea. Photo: A village girl getting her height (and BMI) measured. The villagers who received healthcare services from the medical team faced several healthcare access barriers. That a large number of them did not have health cards, distributed to poor households, meant that the majority could not access health services available at the public health facilities. For those who could, the closest established hospital and specialist clinic is around 40 km away from the two villages. Poverty and the lack of education were also barriers to leading healthy lifestyles. Many villagers—both men and women, for example—were found to be smokers, not knowing the negative repercussions this would have on health status. The Project Sothea team reached out to a total of 776 villagers from 171 households during the medical mission spanning over a 6-day period in December 2017. Among the villagers, 40.3 percent were males and 59.7 percent were females. That there were a greater number of female villagers who received health screening and medication was not deliberate. It must be noted the gender imbalance stems from the fact that women tend to be left behind in the villages while their husbands are away working in the forest or on the family farm, which is usually a distance away from the village. The medical mission reached out to 348 adults and 452 children who underwent basic health checks and sat through health talks on topics related to basic nutrition and healthy lifestyles as well as chronic illnesses such as diabetes and hypertension. Some also received medications for their ailments after the health screening exercise. Photo: A member of the medical team conducting a capillary blood glucose test for a female villager. At the health screening, the medical team also installed a station that focused on family planning and infant care with the aim of educating the female villagers. The different contraceptive methods were highlighted and women learned that the pill and condom were the most effective methods. On infant care, women learned the signs and symptoms of illness in a child that should prompt them to seek immediate medical care. These signs and symptoms could include blood stained stools, high fever, severe rashes and diarrhoea. They also learned not to ignore a child’s persistent crying or loss of appetite as these could indicate illness and that the child needs immediate attention. Mothers also learned how to care for the child, such as body hygiene including how to change diapers, and the importance of breastfeeding for at least 6 months. Women were also reminded to weigh their babies regularly. Photo: A member of the team educating a mother about family planning. 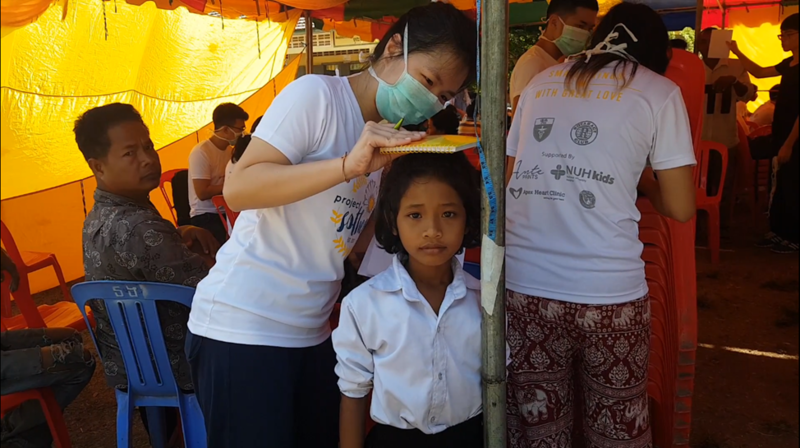 The medical team also reached out to two schools — Kiri Selekeow Primary School (in Anlong Svay) and Phakday Primary School (in Dangkut Thnaong) — and developed a structured health education curriculum for students. Aside from learning about basic hygiene such as hand washing, keeping nails clean and neat, showering, brushing teeth and so forth, Primary 5 and 6 girls were also introduced to proper menstrual hygiene such as using a sanitary pad or clean cloth during menstruation and were advised to use a hot water bottle to relieve menstrual cramps. It was also found that the use of commercially produced sanitary pads was not common because the ordinary village woman was not able to afford them. 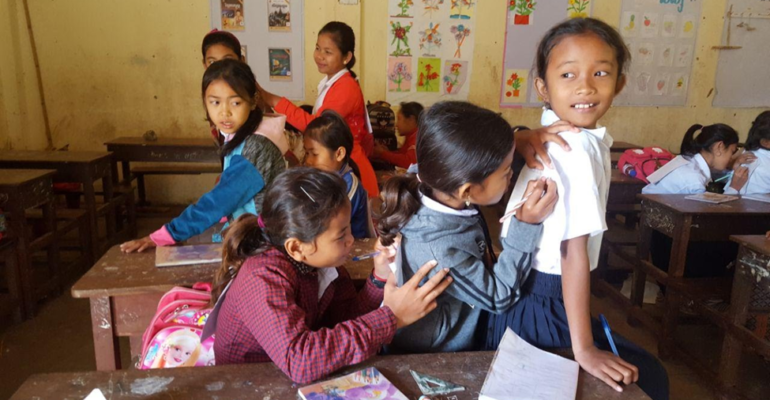 Female students at one of the schools were encouraged to write about their emotions and concerns about puberty and menstruation and being open about it. During the medical mission, the team also conducted a baseline survey. Data were collected on villagers’ knowledge of hypertension, diabetes, obesity, tuberculosis, infant care, smoking, nutrition, headlice, family planning and alcohol use. It is planned that the data would be useful for future medical missions”.